A Yippie demonstrating to "bring an end to pig power" at the 312 Main Street police station. 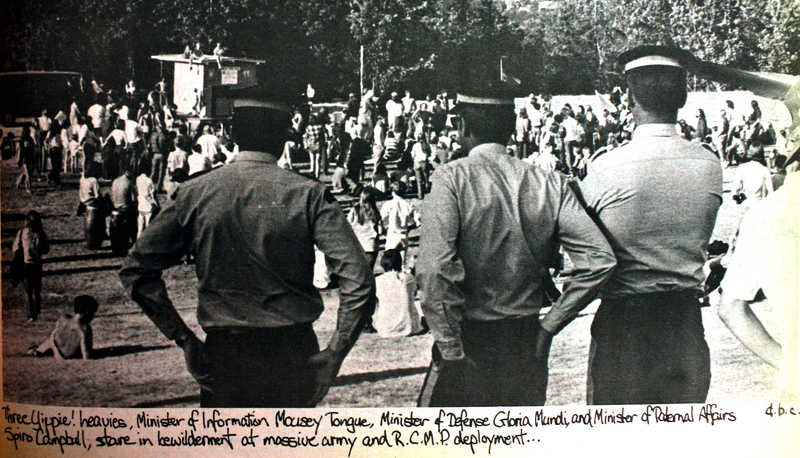 Vancouver was a hotbed of social unrest in the late 1960s and early 1970s. For one thing, the city’s traditional role as the terminus for transients made it irresistible to the flood of meandering baby boomers from across the country and from south of the border, particularly draft dodgers and hippies. Of course, divergent attitudes around such things as recreational drug use, hairdos, war, authority, and sexuality fuelled the generation gap between boomers and their elders. Throw anti-hippie Mayor Tom Campbell into the mix and conflicts between “The Man” and young people were pretty much inevitable. Spearheaded in the US by Abbie Hoffman and Jerry Rubin, the Yippies pioneered a lighthearted and often absurd approach to social activism. They looked to mass media and media techniques as a means to raise awareness about the issues they took on. For Yippies, a memorable sound-bite trumped the staid rhetoric of the traditional left. 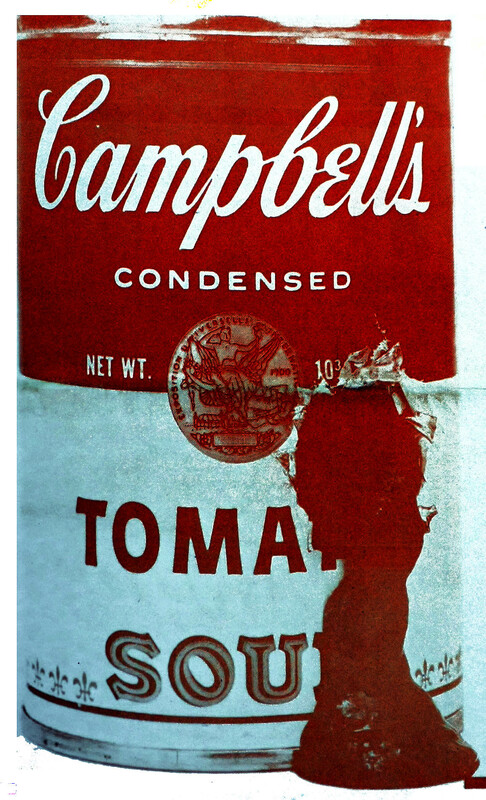 A bleeding Campbell's tomato soup can. 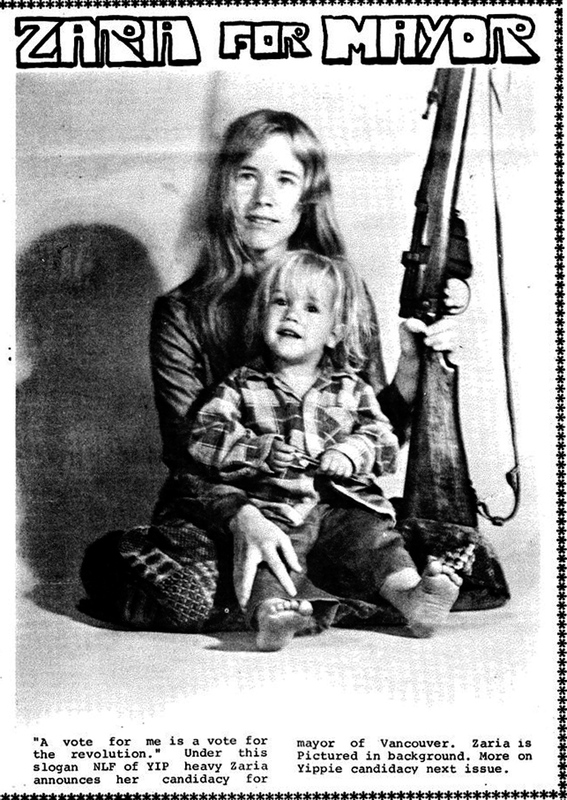 This image appeared on the cover of Yellow Journal #6 (July 1970). Presumably it's a reference to Mayor Tom Campbell, arch-nemesis of hippies, Yippies, longhairs, dope fiends, pinkos, etc. Yippies attempted to appeal to both the typically apolitical middle class hippies and the hard-nosed political left. Their constituency wasn’t the proletariat or other traditionally oppressed groups, but rather the youth counterculture. Their hope was to politicize hippies and make activism fun. “Revolution for the hell of it,” as Abbie Hoffman put it. Yippie! formed after the March 14 street action against Repression organized by several activist groups. Five hundred people took over the streets and danced to the courthouse. One hundred and fifty carried on through the Bay afterwards and threw pies at the White Lunch store front windows. Hundreds joined Yippie! in support of brother Percy Smith at the Cloverdale Magic Marijuana Festival and later the Bay Sip-in. One thing that differentiated Vancouver Yippies from their American counterparts is that there were no charismatic leaders akin to Hoffman or Rubin in the States, which likely made it easier for them to coordinate actions with other organizations. 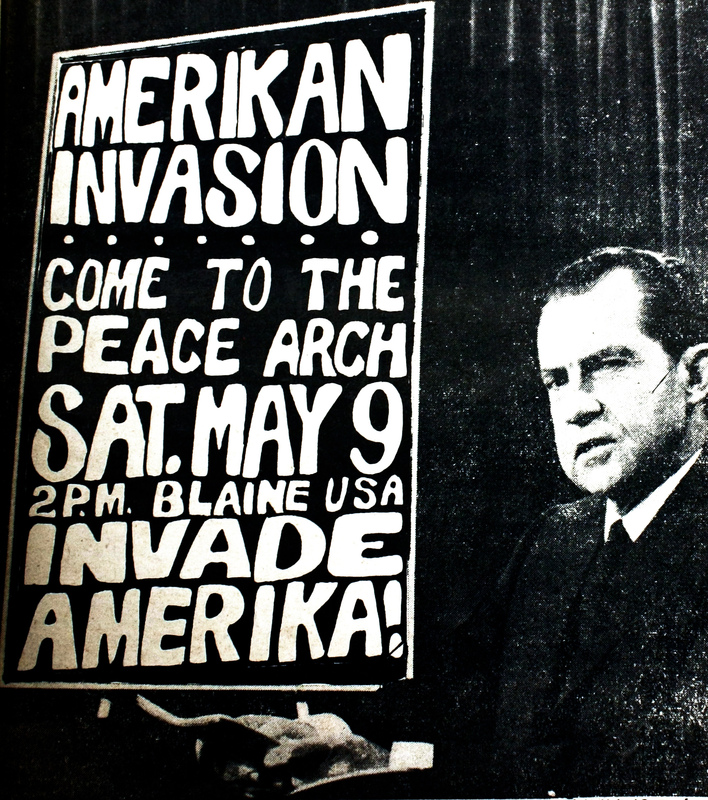 Ad for the "Amerikan Invasion," from the Yellow Journal, 7 May 1970. 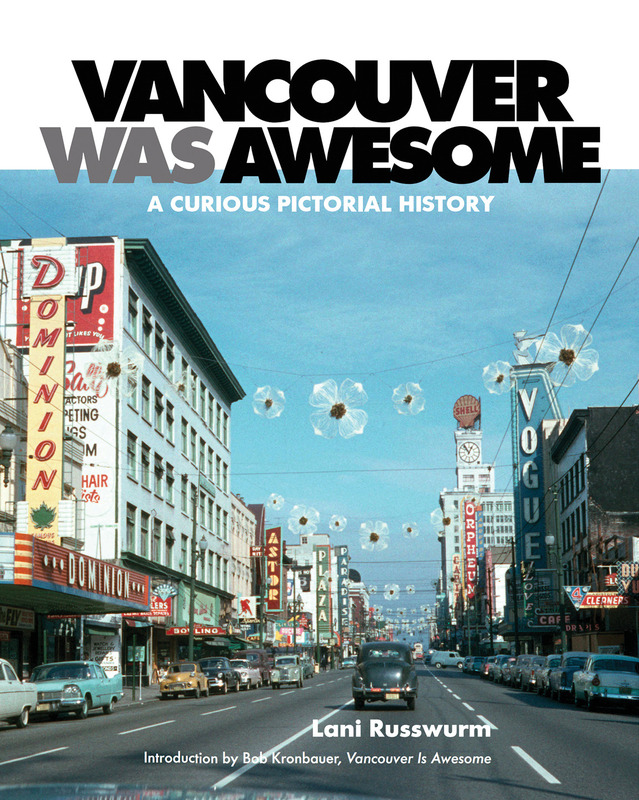 Even though it took place during a strike that shut down both Vancouver daily papers, the most successful Yippie action in terms of the notoriety they achieved was the “Invasion of the Amerika” on 9 May 1970. 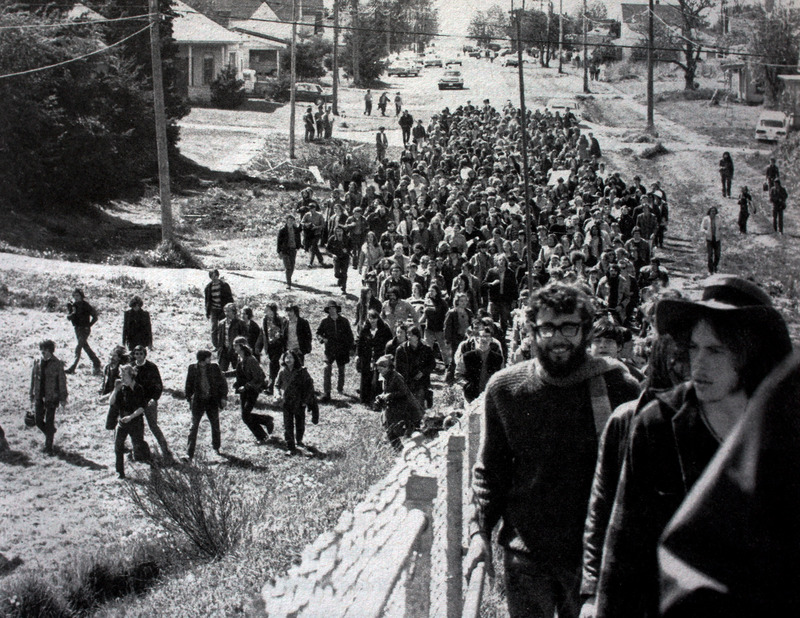 Five hundred Yippies, co-organizers from the Vancouver Liberation Front, and supporters of both groups stormed across the border and marched through downtown Blaine, Washington to protest the American invasion of Cambodia and the killing of four Kent State University students by the National Guard at a rally on the Michigan campus the previous week. Protesters spray painted slogans on the Peace Arch, heckled the police, and tore down an American flag at the Blaine post office. Some of the more boisterous of the bunch smashed windows at the Bank of America branch and engaged in fisticuffs with local patriots who attacked them. The riot police then moved in to drive back the invaders, at which point bottles and rocks began to fly. As the crowd was dispersing, a Vancouver-bound train rumbled by carrying about 100 new cars and three trucks that were damaged to the tune of $50,000 by rocks thrown by demonstrators. Acting Prime Minister Mitchell Sharp called for a report on the action and denounced the Yippies in the House of Commons. The Blaine police chief said it was probably instigated by American draft dodgers and BC’s Attorney General called for charges to be laid against those who damaged property. The Seattle Post Intelligencer said it was “the greatest insult to the United States since the Alamo,” according to the Yippie paper, the Yellow Journal. For the Yippies, the event was a success. They could claim to have led the first Canadian invasion of the US since the War of 1812. Another issue Yippies took on was prison justice. 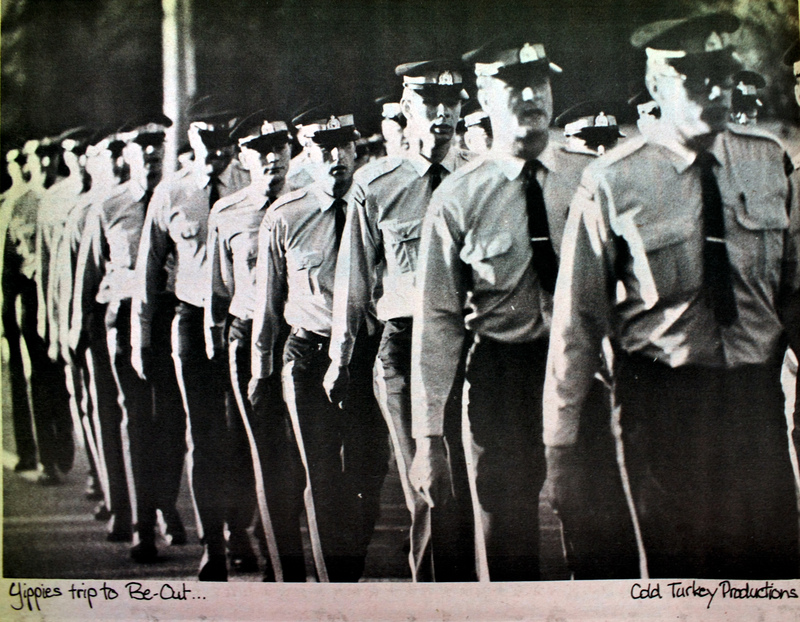 To protest the abhorrent conditions at Oakalla, which even the Sun acknowledged was hardly BC’s greatest achievement, Yippies organized a “Be-Out” just outside the prison’s ten-foot high wire fence in Burnaby on 12 July 1970. About 300 demonstrators attended and pulled down a 200-foot section of the fence. Only a few ventured onto the prison grounds, where about 80 guards were assembled. They chanted, set off fireworks, and planted a Yippie flag on the fence, while a column of about 50 unarmed RCMP officers arrived on the scene. A couple of short-haired men came down from the crowd of onlookers, tore up some Yippie banners, and yelled: “You’re all losers. Why don’t you go home and collect your welfare cheques?” Protesters responded in kind, and the two men eventually left. The Yippies then moved to a nearby park for an evening of speeches, rock music, frisbee throwing, and other games such as Find-A-Narc-In-The-Crowd. One of the speakers had spent a total of three years in prison for two convictions of marijuana possession. “I am meaner. I am tougher. I am smarter and I am a revolutionary now,” he told the crowd. Betty "Zaria" Andrews, Yippie mayoral candidate in the 1970 municipal election. “Look … you ain’t cute. How old are you? What are you carrying that toy gun for? “I’m 24, and you have liquor on your breath,” was the reply. Campbell shot back: “What are you on … marijuana?” The Yippie replied that marijuana was not an addictive narcotic like alcohol. Zaria lost the election, but managed to garner 848 votes. 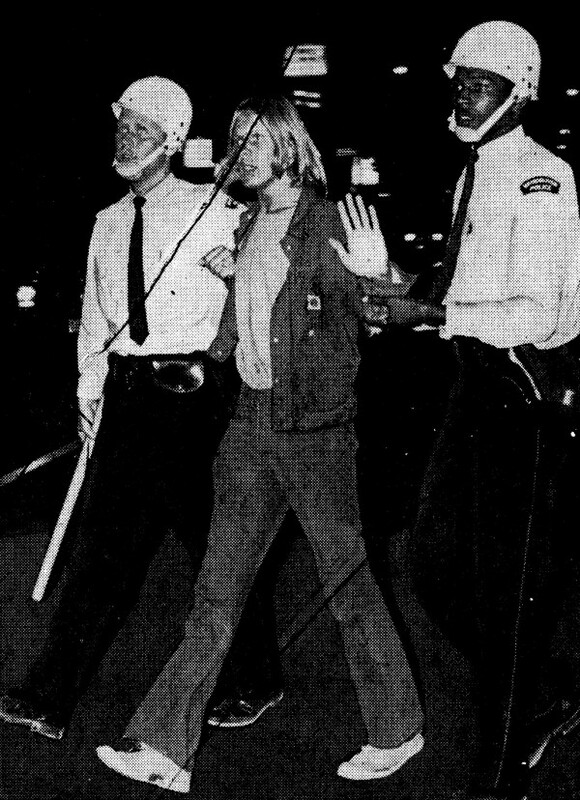 A protester being arrested at the English Bay riots, July 1970. 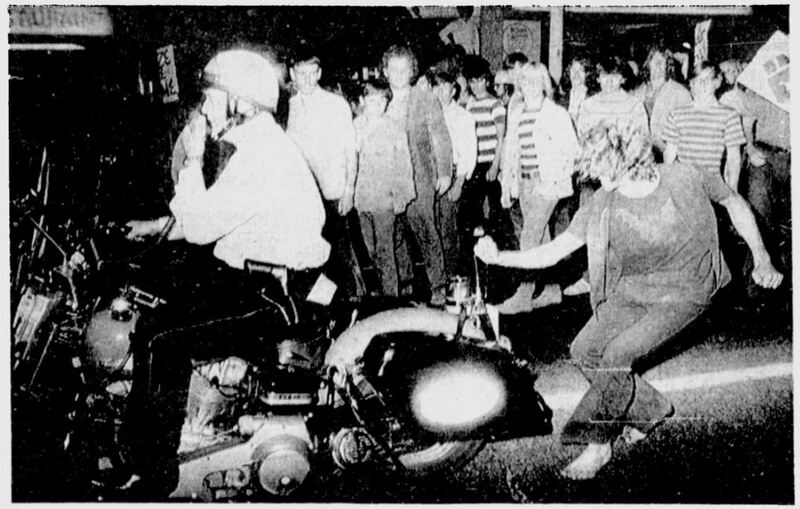 After the Gastown Riot in August 1971, the Yippie light began to fade. It was already a spent force in the US and the Yippie strategy appeared limited in its effectiveness and unsustainable, and to many activists, undesirable. Tom Campbell’s retirement from civic politics and the rise of the provincial New Democrat Party in 1972 also softened the rift between the conservative “establishment” and the more progressive baby boom generation that had been generating social conflict. 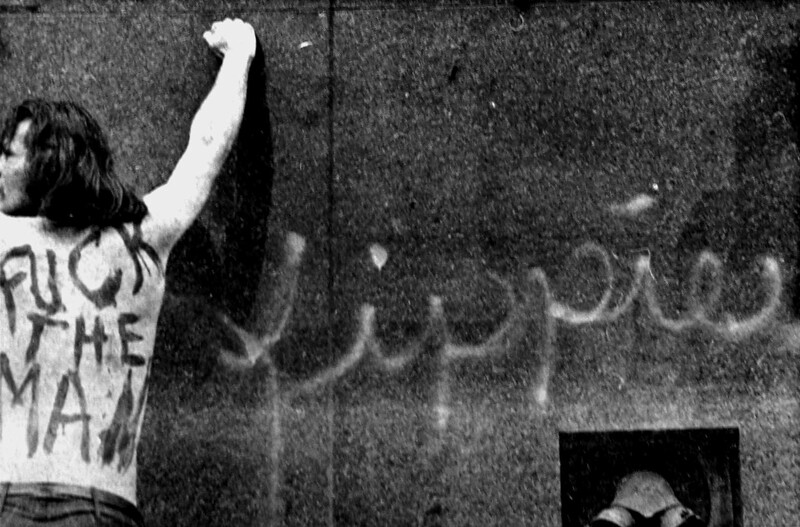 Nevertheless, the Yippies from the summer of 1970 did leave a legacy for Vancouver activism. In 1976, some of them started Open Road, an anarchist newspaper with an international audience that published for a decade, and there has been a continuous anarchist presence in Vancouver ever since. The guerrilla theatre approach to politics occasionally resurfaces, including colourful candidates running in civic elections, from Mr. Peanut in the 1970s, to Zippy the Circus Chimp in 1996. In general, Vancouver protests have had a playful aspect to them since the 1970s, in contrast to the serious and militaristic demonstrations led by the Communists in the 1930s. For more on the Yippies, go see Yippies in Love, a musical written by retired journalist and Yippie, Bob Sarti.